We’ve reached that fork in the road: with publication of my book round the corner, I’m finally leaving this blog behind, and forging onward to my new home at nickhuntscrutiny.com — beautifully re-designed by my good friend Joseph Hughes. The new site contains (almost) everything on this blog, as well as my other articles, stories and experiments in sound. See you there! To coincide with the long-awaited publication of The Broken Road, I was interviewed by The Telegraph Travel a couple of weeks ago. You can read it online here. Nicholas is an excellent editor with a sharp eye for revisions and changes and a strong sense of what my walk was about. Many thanks to him, and to my agent Andrew Hayward for believing so powerfully in this project. Look out for updates on the book’s progress over the next few months. 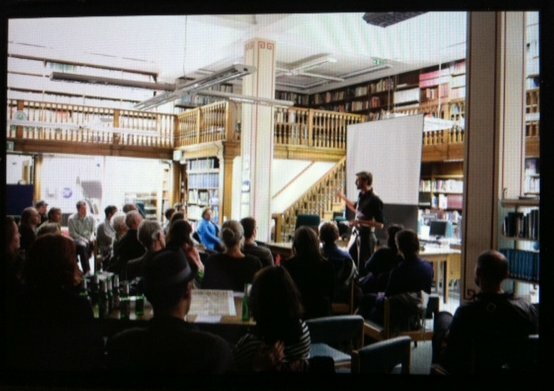 There will be a new website before long, and talks and storytelling gigs coming up. 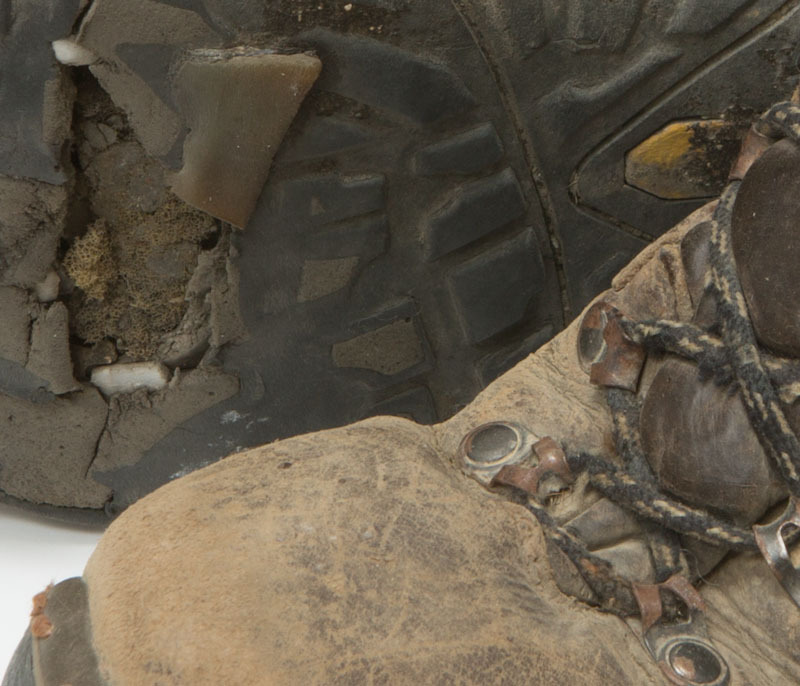 My boots are shortly to feature in an art gallery in Brighton, along with some of the sounds from my walk… more on this soon. The first-ever Transylvanian Book Festival is taking place in September. I’m very honoured to be included in a line-up of incredible authors including Artemis Cooper, Roy Foster, Jessica Douglas-Home and William Blacker. 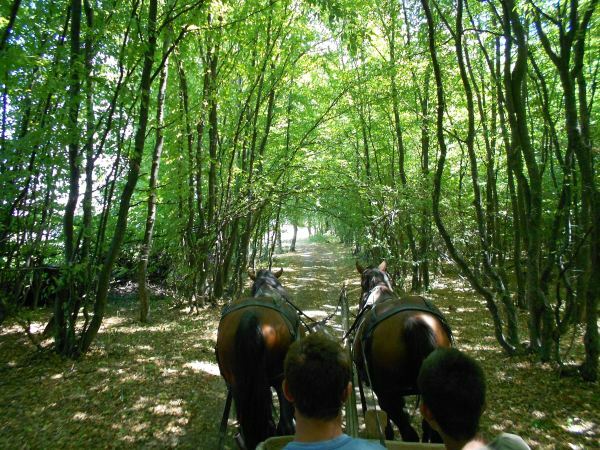 As I hope the articles I wrote on the road made clear, Romania is a special place, from deep green Transylvania and the ghosts of vanished cultures to the wolfish Carpathian mountains. If you’ve never been before, this festival provides a perfect opportunity to come. You can find out more, and book tickets, here. 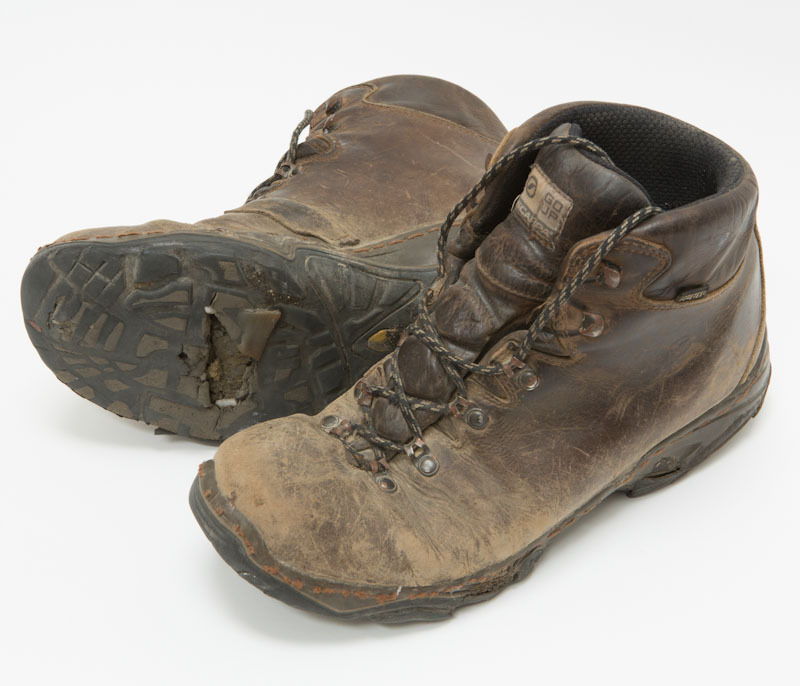 … a rambling exploration of Europe’s invisible pathways, its not-so-invisible motorways, ancient borders, modern-day myths and the multiple layers of story that lie beneath every walker’s boots. 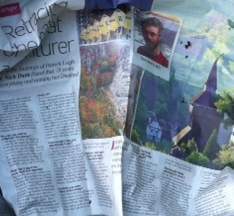 Thanks to Tim Mitchell, David Lintern, Ingrid Plum and Foster Spragge for putting on such an inspired night of talks, songs and art linked by walking. My walk had as many stories as there were roads to Istanbul. 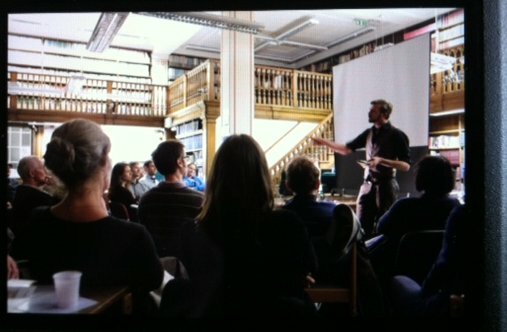 I’ll be doing more talks — and a lot more storytelling — in the near future. 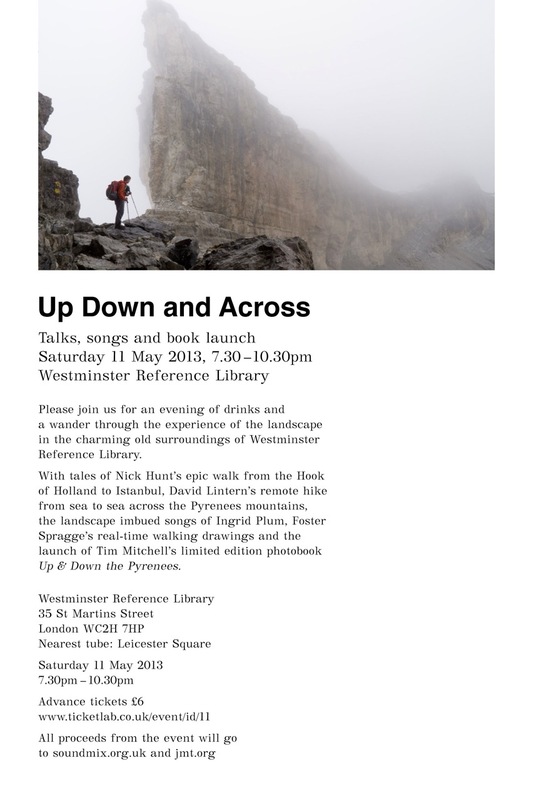 If you’re free and in London on 11th May, I’m taking part in Up Down and Across — an evening of talks, performances and art about walking in Westminster Reference Library. I’ll be talking about roads, landscape, stories and other things relating to my walk to Istanbul. Other participants are mountaineer David Lintern, performer Ingrid Plum, artist Foster Spragge and photographer Tim Mitchell, who’s launching his limited edition photobook ‘Up & Down the Pyrenees.’ All proceeds from the event go to the music education charity Soundmix and the conservation charity The John Muir Trust. You can book tickets here. Facebook page is here. See you there! My feet came into intimate contact with the road on the final miles to Istanbul. 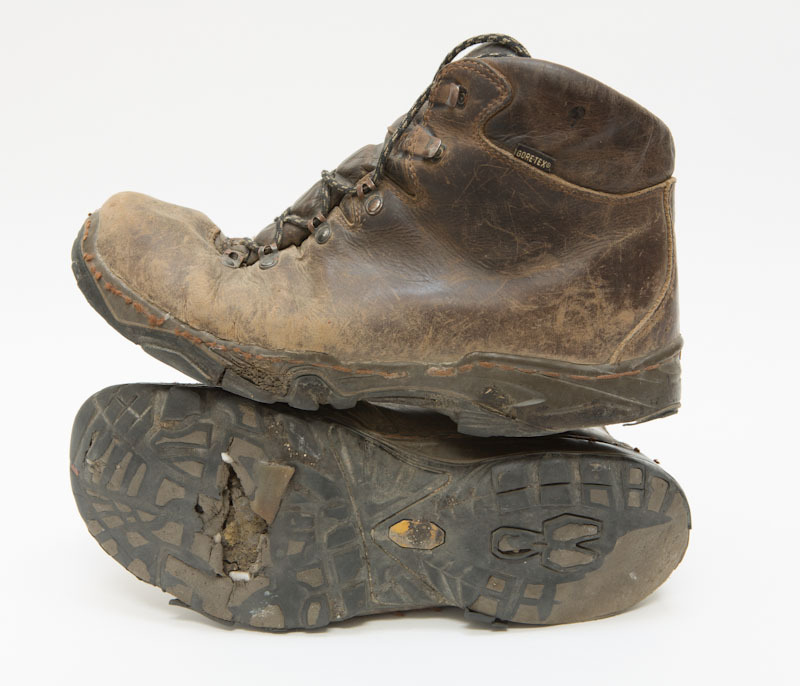 Here are my boots after two and half thousand miles. These glamorous portraits were taken by my friend Tim Mitchell, photographer and Pyrenean walker. Hello folks. To announce: I’m nearing the end of the first draft of my book about these travels. But in the meantime, I have another book to flog! Loose Words is a limited edition paperback — lovingly homemade and hand-bound — containing quotations from some of the weird and wonderful people I met on the road. I can make and send you a copy for the price of £8.00. For an additional few quid, I’ll include a CD of ‘Loose Noises’ — the soundscapes of church bells, street musicians, political rallies, snarling dogs and drunken Bulgarian mountain songs I recorded on my journey. It’s seven and a half months of walking compressed into forty minutes of sound. 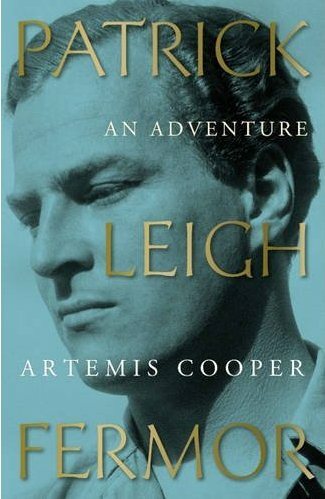 Last night I was at the book launch for Artemis Cooper’s amazing biography of Patrick Leigh Fermor, An Adventure. I was honoured to be interviewed, alongside Colin Thubron and Robert MacFarlane, for the Today programme on BBC Radio 4 — you can hear it here. It was wonderful to gather with people who knew and loved him well. Artemis told me she keeps the postcard I sent her from Heidelberg’s Roten Ochsen Inn inside her first-edition copy of A Time of Gifts. That means a lot. The evening made me think a lot about what I’m setting out to do with my own writing. As reviews like this make clear, Paddy was a towering figure both in literature and in life, and his presence over my work could perhaps be seen as daunting. But last night really helped bring home what my book is about, and what it’s not. For a start, it’s not biographical. I’m not writing about Paddy, or even writing about his writing, but about his journey and all the wonder, mystery, wildness and adventure that it opened up for me. It’s not about history, as such. Obviously history underlay every step I took on the road — history was in every hill I climbed, and every face I saw. Of course I’m writing with awareness of immense historical change, and much of my journey involved searching through history’s rubble, both in reality and in imagination. But a book can be saturated in history without being a ‘book about history.’ I’m less concerned with ‘history’ than with ‘stories,’ and especially with the border — far more porous than we know — between history and myth. Colin Thubron spoke last night of how Paddy is ‘a marvellous example of somebody who can’t be followed.’ This is in my mind as I write — following the unfollowable. I did follow Paddy’s path, but where it leads me will be somewhere else entirely. I followed his route, but the journey is my own. I have to let my story tell itself — and afterwards, when it’s told, I can let Paddy’s presence back in to illuminate what it needs to. Now I’m six rough chapters into my book, and have retraced my own journey as far as Budapest. I’m loving every minute of it. Expect updates soon on publishing news. Until then, I strongly recommend you buy a copy of Artemis’ book. It’s a journey in itself. Although I have no religious beliefs, this walk has been a pilgrimage of sorts – or, at least, has taken on many attributes of one. 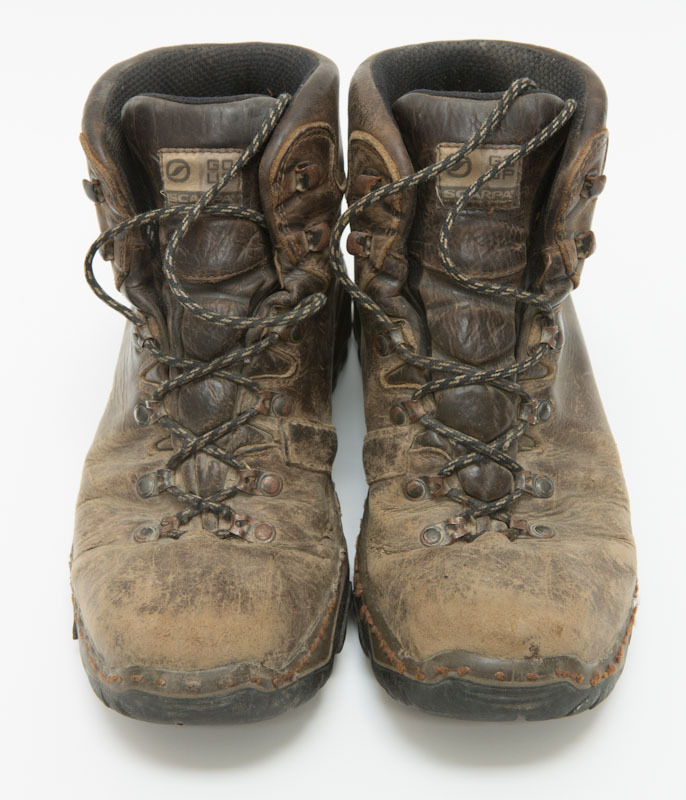 Atheists can have pilgrimages too, and mine has involved physical hardship, and occasionally mental hardship, the retracing of a once-trodden route, and the process of arriving at a destination of deep importance. On the way I’ve experienced wonder, and genuine moments of transcendence, to which the hardship has obviously been essential. 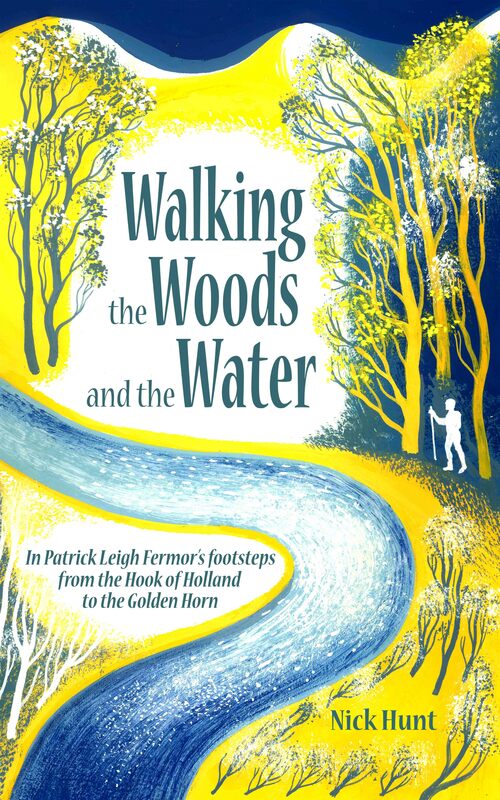 On several occasions I have felt the presence of Patrick Leigh Fermor – not in a looming, ghostly sense, but in the absolute certain knowledge that he had been in the exact same place, or looking at the exact same thing, as I was eight decades later. These were not places mentioned in his books, and the certainty I felt bordered, at times, on the uncanny. In this, and many other senses, the journey has been a spiritual one too. Last summer, before I started walking, I met someone else who had walked to Istanbul, though by a different route. He talked a lot about pilgrimage, and pointed out that ‘before planes and trains, pilgrims had to return from their destination by walking. Constantinople or Rome was the journey’s centre point – your real destination was your front door.’ In the original sense of pilgrimage, the journey home was as important as the journey to the place of worship, because this was a process of integrating the knowledge the pilgrim had gained on the road into his or her everyday life – and of making that knowledge useful. Since arriving in Istanbul – the centre-point of my journey from home – I’ve had suggestions from many people that I carry on walking, or at least return home slowly, overland. I’m deeply grateful for all these suggestions, and for the offers of further hospitality – originally I had intended to hitch-hike, take buses and maybe ferries and trains, and spend a few weeks on the return, becoming acclimatised. However, this won’t happen this time. England is important to me too, there are people there I need to see and things there I need to do, and I have reasons for going back now – reasons that really matter. So tomorrow morning I’ll do the thing I always said I wouldn’t do, and board a plane that will take me home in around four hours – 224 days of walking reduced to less than half a day. In many ways the idea terrifies me, and I’ll spend the duration of the journey staring out of the window and wondering what’s down there, what mountains and forests I’m not walking through, what landscapes I’m not understanding, what people I’m not meeting. I experienced something similar the time I caught a train in Germany, when I’d crippled my left foot, and the few times people drove me around on day trips here and there – travelling at even these speeds was shocking enough, after walking pace, so God knows what flying will be like. But it’s ok. It really is. It’s part of the journey too. I’ll just have to try to compress my homecoming integration-of-knowledge into four profoundly disorientating hours – or, more excitingly, into the book. Every experience is interesting, and everything is important. That’s one thing that walking has taught me, and I’m not forgetting it now. Still, though, it makes me realise something seldom understood about flying – something you only come to understand if you value travelling slow. If the meaning of life – or one of them – is the accumulation of memories, stories, experiences and adventures, and truly living in the world, then flying is not an efficient way to travel. Travelling quickly is a waste of time.